Achieving Professional IT Certifications Does Not Get Easier Than This! 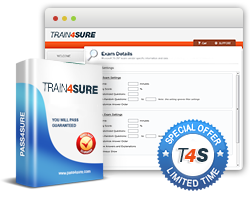 With proven exam training solutions from Train4sure, you are GUARANTEED to pass your certification exams! Industry's leading destination for top-notch exam training solutions that provides latest content and 24/7 customer support. Hassle-free learning starts immediately as your training materials are available for instant download right after the purchase. No waiting required! Reliable learning materials that have been verified by certified IT trainers and reputable experts, plus money back guarantee! 90 days of FREE updates guaranteed with each purchase. Excellent reputation for quality learning solutions, with over 121,487 of happy customers worldwide. Train for Multiple Exams and Save Your Cash! If you decide to take a few certification exams, you are likely to run into a huge cost of your learning materials! Even if you find a great deal, paying for multiple exams is sure to get costly. With this in mind, we developed our special offering: Unlimited Access Megapack! Have flexibility in your learning schedule with our 3, 6, 12 month subscription options.